Ronald Rodman began his law career in 1987, when he was admitted to the Florida State Bar. He is also admitted to the Rhode Island Bar, U. S. District Court, Southern and Middle District of Florida. After earning his Bachelor of Arts degree from Emory University, Mr. Rodman continued his studies at the University of Miami School of Law where he was a member of the Society of Wig and Robe and the University of Miami School of Law Mock Trial Regional Team. 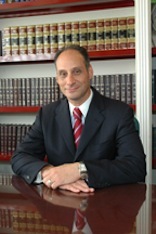 As a member of the American Bar Association, the Academy of Florida Trial Lawyers, The Association of Trial Lawyers of America, as well as the Dade County Trial Lawyers Association Dade County Bar, Mr. Rodman has established a nationwide network of attorneys and expert witness resources to work with on cases throughout the United States. Mr. Rodman has handled cases all over the state of Florida and throughout the United States.